Taste test: These things taste just like a McDonald's cheeseburger. And they're quite addictive. I know this one guy named Stewart who personally ate 29 bags of them. And he would've eaten 30 if I hadn't taken the other one. 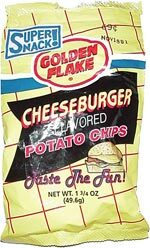 This snack was discovered by Keith and Melissa at Winn-Dixie.